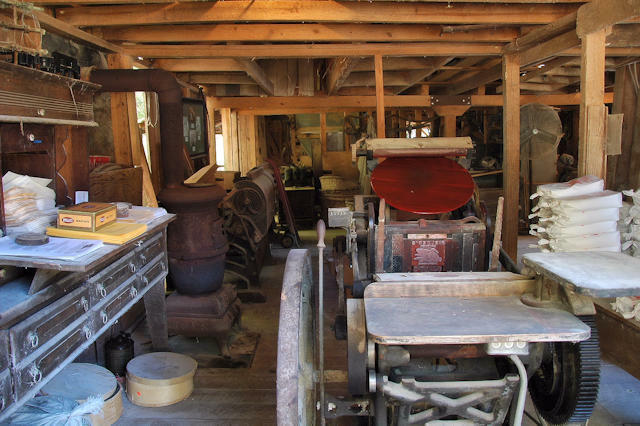 The historic Fielder’s Mill, one of the oldest continuous businesses in Talbot County, takes center stage at the annual Plantation Days in Talbot. It was built in 1930 on the site of the John Downs grist mill. 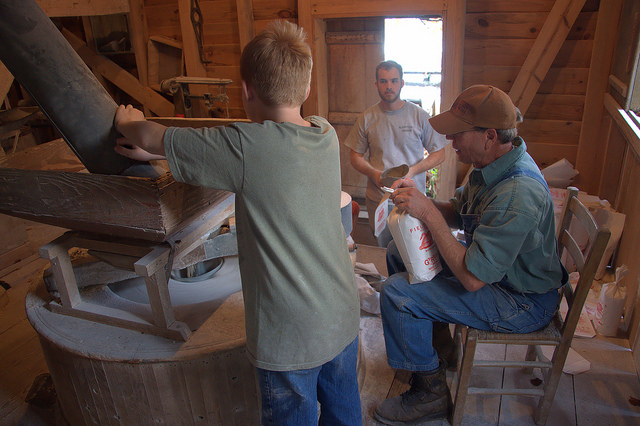 There’s been a mill at this same location since the 1840s. The original mill was located on the far end of the present dam over the run of Patsiliga Creek. The timbers and foundation of the old site remain today. After a fire, the new mill was moved to the west end of the dam in 1930. 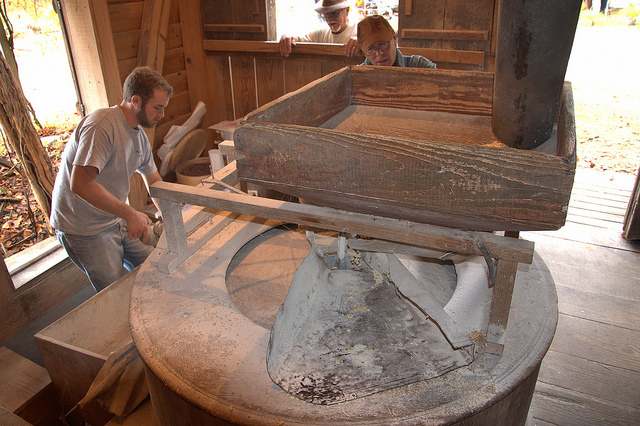 The mill is powered by a Leffel-type turbine producing about 25 horsepower. 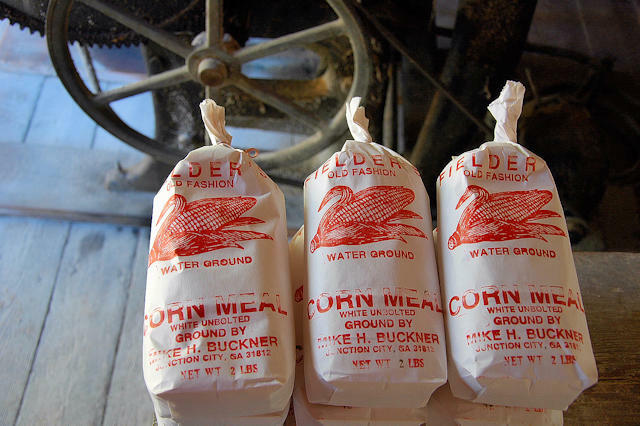 Mike Buckner produces great cornmeal, grits, and flour at this water-powered mill. I believe my father began buying corn meal from Mike in the 1980s, when he was running to Manchester on the railroad. My family has used it ever since; it’s just not an option to run out as nothing comparable can be found in any grocery store. Here’s something from the Fielder’s Mill Cookbook, compiled by Mike & Debbie Buckner in 1994. Measure the amount of grits you wish to cook. Put grits in a deep bowl (I use a deep Cool Whip bowl for as many as 4-6 servings) and add plenty of warm water. Stir grits. Bran and specks will float to the top of the water; tilt the bowl to one side and pour the water and bran off. Do this procedure several times, usually three times or until the grits are “clean”. Place grits in a boiler, adding enough water to cover well. Cook on low heat for about 45 minutes. The water will cook out soon after heating; add more water or for a creamier taste add milk. There is more involved in cooking the course ground grits; however, the taste and added advantage of more dietary fiber make them an excellent substitute for quick grits. It seems the longer grits are cooked, the better they are, but you will have to add more liquid and stir them to prevent sticking. There are a number of variables so you may have to experiment and try cooking these grits a couple of times before you master their creamy goodness. Wash grits as described above and place in the crock pot with appropriate amount of water, salt and butter before retiring for the night. Turn the crock pot on low and allow the grits to cook about 10 hours. Wake up the next morning to creamy grits. (If the grits are too stiff add water or milk-stir).